Winter is the perfect time to prune your deciduous trees. Once the trees lose their leaves, you can view the structure of the trees more easily. This can make it easier to see what needs to be done and see any problems that should be taken care of. Winter is also the dormant time for these trees. This means that the fresh wounds will only be exposed for a short time and that the insects/diseases that are more prevalent in Spring, are not attacking your wounded tree in Winter. Pruning in winter also promotes faster regrowth in Spring. What are the Benefits of Pruning? First, it is about safety. You should cut back branches that have overgrown in areas that could be annoying or dangerous – for example, over walkways and driveways. Also, branches that have overlapped and can cause damage to each other can be pruned so that the healthier branch will remain. And, lastly, removing dead or dying branches now is better than a storm breaking them and causing damage to other plants, property or yourself. Pruning allows sunlight and air into the center of the tree – just enough to promote healthy growth. Beauty is the last, yet still important, reason to prune. To cut back the branches and foresee what the tree will look like in spring as it gives out its new growth. Pruning is something you can do yourself, or you can call an expert to do it. 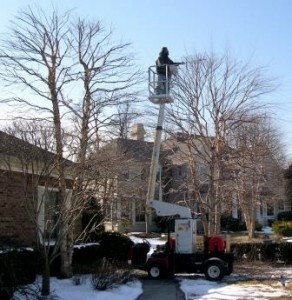 If are unable to safely prune, please call someone who can. And, remember, Truesdale can always help.